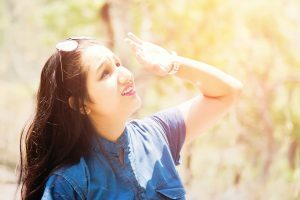 Texas heat is known for being difficult to deal with, but people often overlook eye care when they are planning their strategies to beat the heat. Eyes require protection from the sun’s rays and they must be kept moistened during Texas’s dry heat of summer. Intense heat coupled with dust can create an uncomfortable eye situation. In order to deal with the Texas summer heat effectively, eye protection must also be considered. Taking a few simple preventative steps can keep your eyes safe and feeling great! Keep reading to learn more about some easy actions you can take this summer to keep your eyes healthy in the Texas heat. Many Texans enjoy spending time in the coastal and lake areas of the state during the summer months. While these aquatic playgrounds can provide relief from the hot sun, the rays that are reflected off of the water’s surface can be harmful to the eyes. Investing in a pair of high-quality sunglasses with polarized lenses can help to protect the eyes. People with light colored eyes are especially vulnerable to damage from the sun’s rays and should not venture out into the sun without protective sunglasses with high-quality lenses. Texas heat can be brutal, there are no ways around it. In order to keep eyes comfortable on hot days, eye drops can be effective in replenishing the eye’s moisture and keeping your eyes feeling great. The arid environment of Texas along with the dry heat can create a situation that is both uncomfortable and can also lead to further problems. Dry and irritated eyes are often the impetus for people to start rubbing the eyes which can cause damage. This is a higher concern if a foreign object were to enter the eye and rubbing can then cause scratches on the cornea. It is important to keep us moistened in order for comfort as well as overall eye health. The dry and arid climate of Texas can create an environment that is filled with blowing dust and other debris. People with sensitive eyes should try to avoid being outside during periods of high wind especially when a high level of dust is present. If one must be outside during dust storms and days when there is high wind, it is helpful to wear sunglasses or other eye protection. A wide-brimmed hat or baseball cap can also be helpful in keeping dust and flying debris from injuring the eye. If dust does get into your eyes, do not rub them! Instead, do a thorough rinse with clean and cool water until the eyes are clear. Pat the eye area dry without rubbing. Eye Care Associates, located in Houston is your full-service optometrist office and we are here to meet all of your eye care needs! Please give our office a call to schedule an appointment, we can help with all of your vision issues.